“Come on, lucky seven!” That line has been thrown around in everything from The Simpsons to Hollywood movies. And you will certainly throw it around when playing the Crazy 7 slot by Playtech. The company has decided to get back to the good old days of 1-line casino slots. How they fared, you’ll find out throughout the review. Straight to the point slot game, with no overcomplicated features, Wilds, Scatters, bonus games. Sound effects aim for “funny” but more often than not only reach the “annoying” level. Luckily, you can turn the sound off! 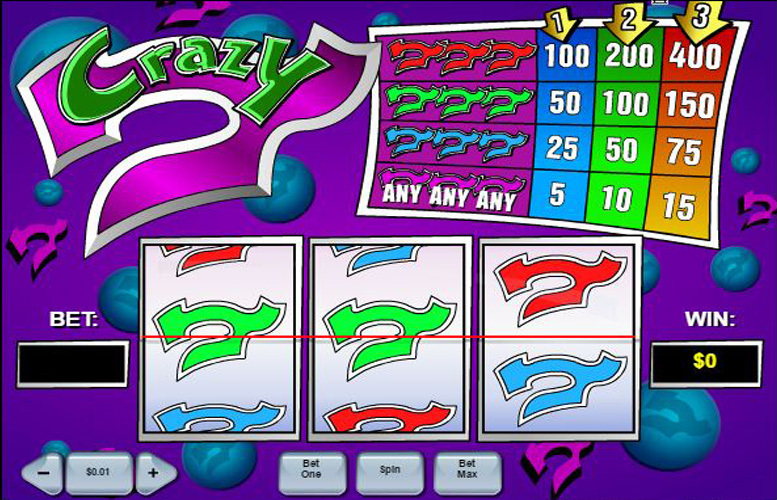 There are no Wild features or bonus games in the Crazy 7 slot. As such, there’s not much in the way of grinding your way to riches by relying on multiple paylines or lucky Wild spins. There’s also no progressive Jackpot fund, so all that remains is a standard Jackpot of $6000. You can win it by betting 3x $5 coins and getting the winning combination of 3 red sevens. That’s all there is to it. Pretty simple by all standards, though the win is nothing to brag about. By the time you hit those “lucky sevens” you have probably spent that amount on coins. Still, the returns playing on the three coin level are decent enough to keep you playing. Even the lowest winning combination nets you a maximum of $75 because of the 5x win multiplier. There are only 3 symbols in the Crazy 7 slot machine, and all of them are (you guessed it) 7s. The only difference is their color, the selection being blue, green and red – in order of their value on the paytable. Most of the time, however, your winning spins will be a combination of the three colors. Two blue sevens and a red one, one green/ red/ blue, etc. Of course, that also means you’ll get the lowest possible prize (only 4x the amount you bet). Quite a great mimic of the feeling you get in actual casinos. Just picture it. You finally manage to get 2 red sevens on the first reels. The final reel seems like it takes forever to stop, and your heart’s racing. Have you struck it rich? Nope. The reel settled for a blue seven and it’s back to the drawing board. Or the casino’s cashier to get more change. The heartbreaking story above did have a purpose. Namely, to discuss the horrible spinning speed of the reels. Annoying sound effects aside (you can turn those off thankfully), we understand that it adds a bit of suspense and “realism” to the game. But it’s a video slot. If we really wanted that high-end realism from it, we would have gone to an actual casino and played there. There’s also the fact that the last reels don’t spin faster if the first one is a dud. What use is there to wait for the others to finish spinning if it’s a sure loss? Playtech could have added a simple “click and skip” option for the more impatient players out there. Or, at least the choice to hasten the animation. Since there is only one payline, you don’t have to worry about any “line bets” in the Crazy 7 slot. The absolute minimum bet you can place is $0.01 in the one coin level. The maximum value of a coin is $5. Of course, if you play at the three coin level, the max bet you can place is $15. All the possible win multipliers are handily displayed in the top-right corner anyway. Nitpicking about the reel speeds aside, the Crazy 7 slot by Playtech is a modestly entertaining experience. If flashy animations and storylines are not your cup of tea, you can spend hours on end trying to get the El Dorado – the three red sevens. It’s great for players who want the retro casino experience with no added bells and whistles. If you’ve got nothing going on one evening, crack open a cold one with the boys and try your luck at Crazy 7. Maybe you’ll win a little extra cash for drinks. Or you could strike it rich, who knows? $6000 might not be the highest of Jackpots, but we’re sure nobody complained about winning it. At least we hope so. Either way, enjoy this retro-tastic addition from Playtech. This game has a rating of 4 / 5 with 614 total reviews by the users.